So.. tada.. my first English post on my blog. I always thought there would be a big need for German explanations in the programming world (and world in general) but.. some things should not be hidden from a wider public – which speaks (or reads) English. I recently wrote a more or less generic wrapper for SendMessage calls to any windows and controls the heart desires (especially the ones in processes that are not your own) – as long as you have got a handle. There is also a lot of fun stuff in here, like working with pointers (IntPtr), allocating memory in foreign processes, linking your own structures via pointers and filling them with values and a lot more to keep yourself busy for the day. Even in version 4, the .net framework and also the C# language is still lacking. Truth to be told, there is a lot a lot there is that is really nice and helps productivity. But some things are just still awful. No multiple inheritance for example (which is not lacking because it is not „clean“ but rather because of technical problems). Another big area of lack is if you are programming close to the hardware, or programming close to the OS. I am doing a lot of the latter recently, and there are just so many possibilities in the Win32 SDK that are not (directly) available in C#/.net that it is a real shame. This mostly applies of course if you want to meddle around with foreign programs (automation in my case) where generally you don’t have a very good range of possibilities from within .net. So after sending a lot of messages and marshalling a lot of structs, I thought that there should be a better way. And it seems that there is. So I started working on a generic function to marshal arbitrary structs (kind of arbitrary, see below). One simple version is the case where the struct is flat, meaning that it does not contain any pointers. Pointers are, some may remember, also used to represent arrays and strings, which used to be char-arrays. Still, quite a few (flat) structs remain, and the following is a straightforward implementation of a wrapped SendMessage with such a flat struct or class T.
// allocate memory - pointer is valid in context of other process, not our own! This version is actually kind of straightforward once you know how it works. The big point is that if you allocate just any chunk of memory, it will be in your local process, which is not much use to the other process, since it is going to assume the memory local to itself. See the beautiful image I created that is nearly self-explanatory. On a typical 32 bit Windows system, you have 4GB of addressable virtual memory (independent of real memory, whether it is 128MB or 128GB) per process. From those 4GB, 2GB are reserved for the Kernel. They are reserved means: no, there are not always 2GB real memory used for the Kernel. 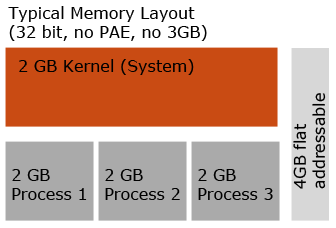 Also, the Kernel/System is always in the upper 2GB – for each and every process. (Again, only on a standard Windows 32 bit system, especially without PAE which gives the OS a lot more memory without giving any process more memory (so the image and model stay the same) and without the /3GB switch which shrinks the kernel to 1GB. Processes on the other hand only have their own address space, 4GB, of which only the lower 2GB are usable (though you can use some of the system memory, e. g. for shared memory files and the like, which would have made this article even a bit easier since that memory is shared between all processes). The problem is, that each process has its own 4GB of addressable virtual (virtual unequal real) memory and all of it (apart from the system part) point somewhere completely different. So: Address 10000 for process1 can have a string stored at its position, whereas process2 can have the memory at address 10000 completely uninitialized and thus accessing address 10000 for process2 results in an access violation, whereas accessing 10000 in process1 would simply return or manipulate a string. So for something like what is being done here, you would have to have your data locally at e. g. address 50000 (whatever you get as a free location from the memory manager), but on the other process, you would have to allocate new memory at say address 80000 (again, where you get it from the system) and then use a function to copy the data there and back again. Note that 80000 will be local to the other process. If you look at 80000 in your own process, you will only get garbage – at least not, what you expected. The solution here is to allocate memory in the process that is going to receive the message (you get the process from the handle), then to move your data into the data of that process (you can see this beautifully if you attach a debugger to the foreign process and open the memory window (from the debug menu) to the position you get in lParamPtrForeign). Once the SendMessage is completed (SendMessage is synchronous, so we can be sure that all the necessary data has been exchanged by that point), we only need to marshal the data back into our local struct, so that it can be accessed like we directly passed our class there (which we did not). The exact way was class->some local memory that can be accessed via marshalling->memory in remote process->some local memory that can be accessed via mashalling->class. Everything becomes a bit more tricky once we also want to allow for pointers in that class. Actually, till you have a working solution, you can spend some hours going through articles on Stackoverflow or PInvoke.net and then pointing with the right pointer to the right item at the right time. No, it’s not rocket science, but it certainly can take some time, especially if you don’t do this every day. So after doing it manually once and thinking that this is a process that I might have to do quite a few times, I decided to do it more generic – in fact, as generic as (to me) possible. So.. in order to allow users to create structs that are directly usable, I decided to allow for struct definitions that contain strings that can be used as-is. So, in order to use the object I would have to create a new type, replacing the strings with IntPtrs pointing to some memory allocated and pre-filled acting as the char-array. At first I thought about using the suggestion by Mrion Abramson in his post about creating new types at runtime, since that is basically what I intended. After some grave thoughts about runtime performance (I would have to create the new type in a new assembly, …) I came up with the easy way, the C-style way, the pointer way. And.. before I didn’t even know that it was possible (kind of) this easy. All things in memory must have a location at which they are stored, since that is also the way in which they are accessed. Many things influence where the data is stored and typically you have no idea where they are stored. Things are a bit different with classes an structs, since you can make assumptions on where the data is stored, at least relative to each other. Data for classes and structs is always stored consecutively. So, knowing that a UInt is 4 byte and it is at position 0, we can guess that our second field will be at position 4 and so on. There are obviously some things that modify this like the packing order which is mostly interesting for alignment (many processors work a lot faster if data is only stored at certain addresses like multiples of 4 or 8) or for values of variable width like an IntPtr, which can be either 4 or 8 bytes. Actually, here I have not taken alignment into account, and simply assume that all your data is packed tight with no filling-bytes in between. Before you demand a new version for classes with a different alignment, you can do the alignment yourself by including dummy data, like if you have a 1 byte value, but konw that the alignment is not to pack on every byte but only starting on every mutliple of 4, you can add 3 dummy bytes to make the alignment work again. A pointer now is going to point to some variable or field. Actually a variable name is like a pointer too, but it always points to the same object. An IntPtr can point to any address and depending on how you treat that address, you can give it a special meaning (that better has to be correct, since this is not typesafe at all). So.. I simply copy each value from the unknown struct, received with type information via reflection into an untyped memory segment, incrementing a pointer by the size of the data copied. For a string (this is tricky again), I allocate another memory chunk, initialize it, and see to it that all pointers are pointing the right way. In the end, I get the data back the same way, copying it with a pointer and marshalling from the untyped memory chunk back into the typed stuct, where it can be easily and type-safely accessed. Around this, there are some allocations of temporary memory, and especially the allocation of memory in the target process before the SendMessage, and the deallocation of that memory after grabbing the information back into the source/target-struct. Right now, the only pointer-type that is supported is the string, though other types are probably even easier to implement by simply generating untyped chunks of memory and marshal them yet again. Another restriction is that for string-output-parameters, the size parameter, that typically is part of the struct, is not set automatically. I might come up with an automatic way, like using naming conventions, after all, some recent software developments have shown the great usability advantage of convention over configuration (so I might have the string parameter have an arbitrary name and then the size parameter have the name „(arbitrary string name)size“ or something similarly insightful). Or just use the next int after a string (though I don’t have enough data to justify this). But for now, this parameter has to be set manually. Also, don’t forget that some structs need preinitialization in order to return meaningful data: often they contain flags of what data you want to get and what parts of your struct are valid and sometimes even about the size of the struct. Also, ANSI is hardcoded – so you might either use the appropriate ANSI-messages (which most often end in an A instead of a U) or you would have to rewrite some code here. Very important: the objects you pass in need to be classes and cannot be structs. This is due to the factor that the method I use to write the values back to the original object is FieldInfo.SetValue, which expects an object. In order to use structs there, they are boxed. And then.. the update is done on the boxed object, which has no effect on the original struct. so.. USE CLASSES! And, one more thing: I applied all my little knowledge to make this code work in a 64 bit environment. I have little experience in that area so only can go by technical articles and best practices. A major point seems to be the signature of the SendMessage function which should be fine, as well as the handling of pointer, for which I have made distinctions based on IntPtr.Size (which is also a good indicator for what kind of OS you are running, as far as 32 and 64 bit is concerned). Here come the definitions of external functions to call – most of them are from PInvoke. public class TCITEM // this needs to be a class! There is also some example code on how to use it – and also showing which fields still need initialization, like the string length and also some flags influencing the behaviour of the message. The examples are from working with Tab Controls. As always, I hope it is useful to you. Having received so much help myself from a lot smarter people, I am always working on giving something little back out of heart-felt gratitude. It certainly was (yet again like so many other things) an eye-opener to me about some inner workings of Windows, Messaging and Marshalling. Please feel to comment upon anything and everything, I always enjoy getting feedback from my readers. As you may have seen, this is based on ideas and experiences I had in this article about filling memory in a foreign process, which was meant for the SendMessage function as well. Also, there is always loads of information up on StackOverflow on any matter of programming in C#, as well as the information on PInvoke.net, which is very helpful, especially for beginners, but also for advanced tips on many matters (like 64 bit issues with SendMessage). if I commented out the SendMessage statement, then no crash and no update, of course. Could you please take a look of my code snippet and tell me what I did wrong? Most structs I have come across have as one of their parameters their length, and (I think, that is a long time ago) most often arrays are not realized as pointers but simply directly within the struct. Maybe that is not relevant to you since I do not know there stuctures, you definitely need to have them 100%ly accurate. I suppose the whole concept is still a little new to you. Start with easy things and make it more like what you want. What is involved is not always easy at first sight when never used before. Pinvoke is a great resource to get syntax and examples, also, there is msdn or the Windows header files, if all else fails.